So were the words of Marianna from Sew2Pro last Tuesday. I LOVE the GBSB. I watched every episode of the first series on You Tube with pure glee and bliss and excitement and roller coaster emotions. Reality TV at its best! Hang on - there's a second series??? And there have already been seven episodes??? Let's just say that several hours over the next three days were spent very happily ensconced in front of the BBC on my computer. Tip: if you are outside the UK, you can watch the BBC by installing this add-on from Media hint which works on Chrome and Firefox. The episodes will be available until 15th April and the final is tonight!! Get watching people! So, after emerging, bleary-eyed from watching the first seven episodes (I loved every minute), I started considering Marianna's challenge. - use as many techniques from the series as possible in my one garment. 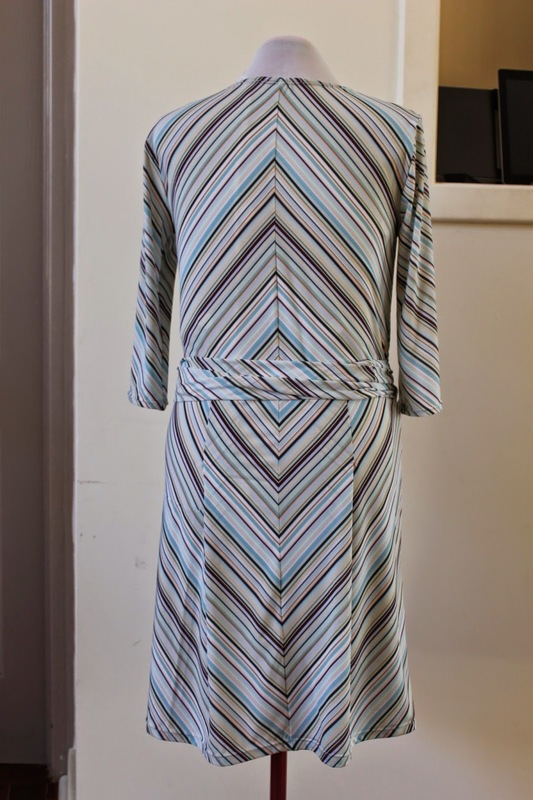 After perusing my stash (that took some time in itself), I decided to use stretch fabric (episode 3) to make a wrap dress (episode 3) and do some pattern matching (episode 2). 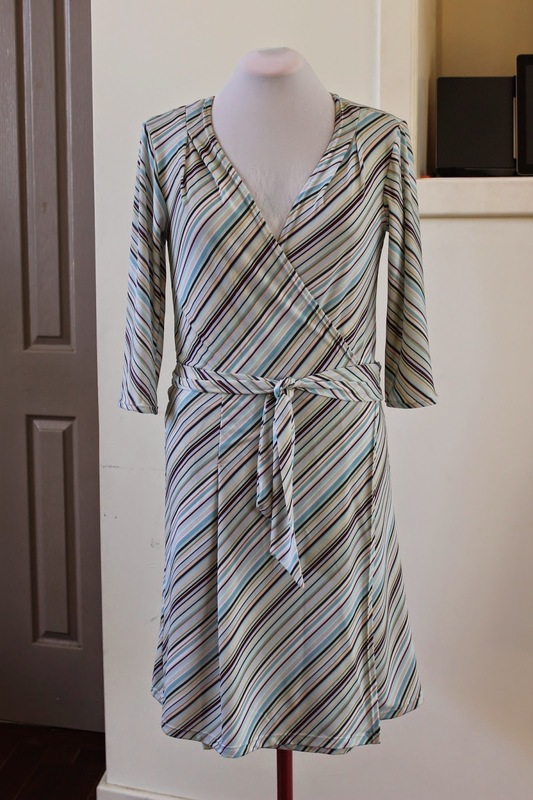 Marianna kindly provided the link to some of the patterns used in the series and I downloaded the wrap dress. 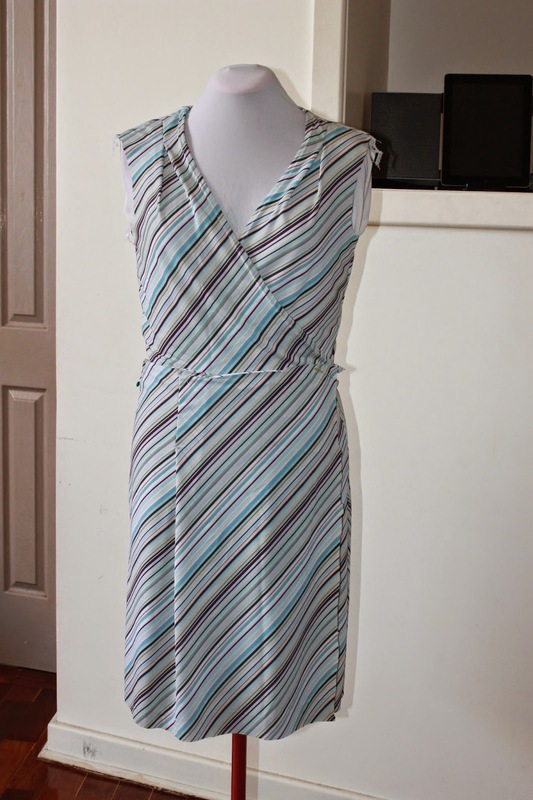 Some detective work revealed that the pattern was actually Butterick 5454. 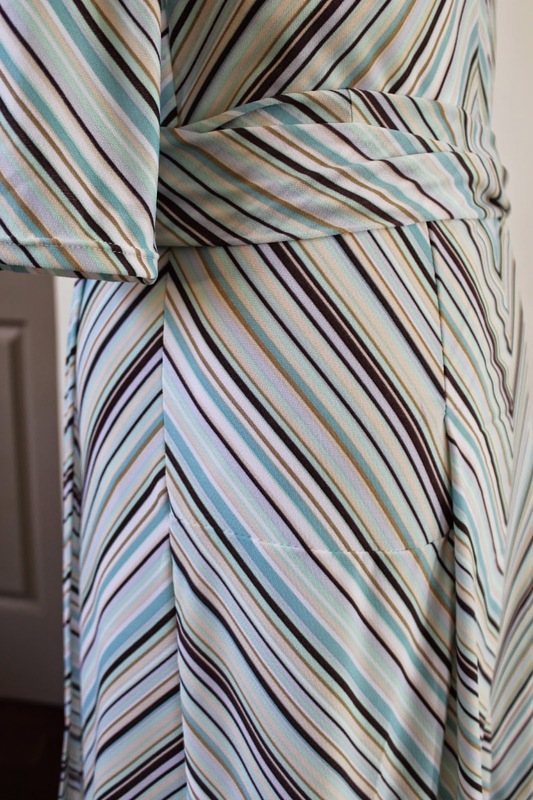 I decided to use some stretch fabric with diagonal stripes for my dress and to cut it in a clever way so that the stripes criss-crossed elegantly and flatteringly at the front and met in a very aesthetically pleasing diamond at the back. No worries mate. So, with the pattern printed and glued together, I set myself three hours for the challenge. Dramatic TV moment 1: The pattern matching was a nightmare. 'Like a TOTAL nightmare' as my son would say. I cut each pattern piece from a single layer then flipped that piece to match the pattern and have the stripes going in the opposite direction. But where was the opposite direction? The diagonal stripes meant that each piece had to be flipped 90 degrees, not 180 as I first thought. Oh dear. Knowing that stretch fabric needs to have the greatest stretch going around the body, this was a bit of a spanner in the works. However, after a quick stretch test, I decided that this fabric was of similar stretch up and down as it was side to side, so I just went for it. I had to cut each piece as I went, rather than being able to lay all the pieces out on the fabric first. I had quite a large piece of fabric ($2 from the op shop - score!) so I thought it would be fine, despite cutting a couple of pieces the wrong way round and having to recut them. It took over an hour to cut out all my pieces except the sleeves and the waist tie. I was careful to match the stripes and orient them in the desired direction. I thought I'd got that right. I thought I had, but I hadn't. I pressed on. Having that timer running was way more stressful that I expected. 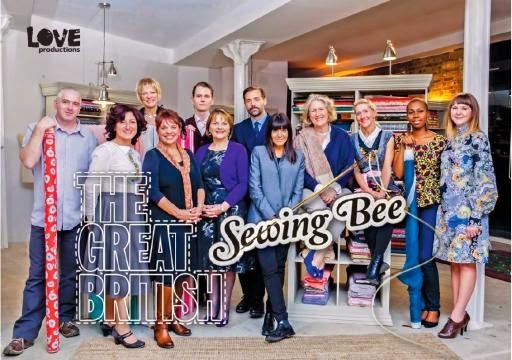 The pressure on the actual GBSB must have been so intense. I started sewing the bodice first. The back was looking good. The front was looking bad. How did the stripes end up in the same freaking direction when I was so careful cutting the pieces? Then, with little time left, I sewed the skirt. Again, the back was the only reasonable section. Before I knew it, there was only one minute to go! Very dramatic TV moment. I forced myself to step away from the machine and put the dress on the mannequin. The bodice and the skirt were still two separate pieces. The edges of the skirt were unfinished, the sleeves and waist tie were not even cut out. I saw Patrick and May approaching and hid the offending pins. Fortunately Patrick and May allowed me to go away and finish the dress before they did their final assessment. I was ready to run fast and far in the opposite direction, tossing the wrap dress in the nearest bin on my way past. I considered my options. Did I have time to go fabric shopping and start again? I pondered some more and then an amazing thing happened. Project Runway's Tim Gunn murmured in my ear: "Make it work". Gathering my dregs of enthusiasm for this project I picked up my dress and my timer and forced myself to continue. It took me another 2 hours and 43 minutes to finally finish. ...but in four different directions at the back"
"The pattern matching is not bad in places" said Patrick. "I love you Patrick" said I. "And the top-stitching with the twin needle is handled quite well" added May. "Oh dear" said May, "what is this seam here? Has a patch been added at the back of the skirt??? 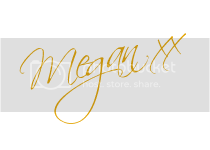 "Meggipeg, you are the weakest link. Goodbye." Well, it's definitely not my finest piece of sewing, or my favourite piece of fabric, but I did challenge myself and, despite some stressful moments, I had a lot of fun with this sew. Is it wearable? Let's see. The back is pretty cool (can you see the patch?). It could be worse. 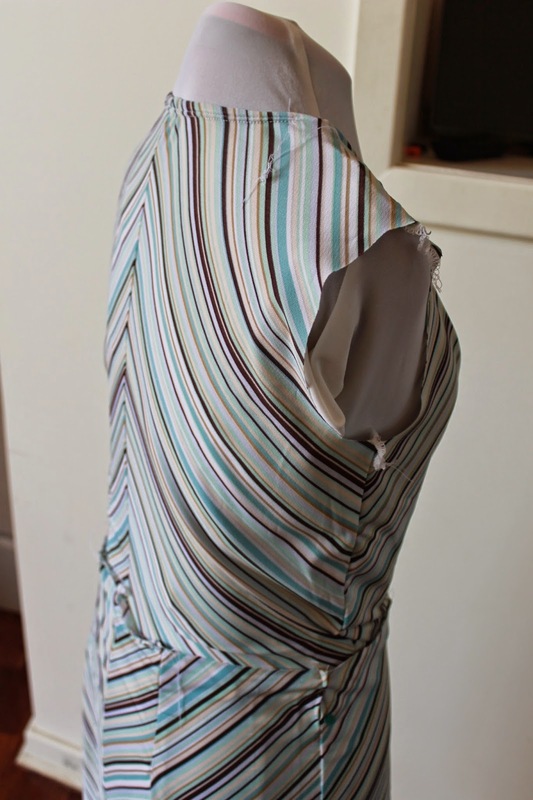 Actually, I really like this pattern and I challenge myself to get some really lovely stretch fabric (NOT striped) and make it properly next time. In three hours. PS. 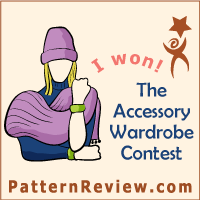 Thank you to Marianna for a really fun competition. Haha! your story is hilarious! but good for you with making it all work out fantastically at the end... because I reckon the final product is pretty darn cute on you! TOTALLY wearable. I'd never have noticed the patch without being told about it :) And now I'm curious about what I could achieve in 3 hours; I'm thinking probably not nearly as much as you did! aaah, the pressure! Oh yes, I did hide part of the patch under the pleat in the skirt so it's ok as long as I keep fairly still! So lovely meeting you yesterday. Looking forward to doing it again. I couldn't possibly let my viewing public down. Yes, there will be a second take. Thank you! Haha! That was as good as watching the show. The tension was unbearable and the finished dress is super. I could hear Mary and Patrick making their comments! I couldn't do anywhere near as well, in fact I wouldn't even try. Congratulations for making it work. . Thank you! I'm sure not quite as good as watching the show, but I'm so pleased you enjoyed my version. I need to watch this show! Everyone keeps going on about how good it is. Your dress is totally wearable, looks great. Can't wait to see your next version of this dress. In 3 hours, of course. You definitely need to watch it, it's so much fun - and thank you for the compliments! 3 hours??? Where does that leave time to go away and have a cuppa tea and think things over? I don't think I want to know how long it takes me to make something. Pattern matching at the back is awesome! I know!! I always stop and ponder, try on, ponder some more during my sewing projects and there is just no time in a challenge like this, never mind the cup of tea. Oh the stress! Oh my gosh - the pedal scene! I can't believe I forgot to include it. Mind you, I'm not sure my pedal would have been visible under the layers of fabric scraps and jumbled threads! Honestly, I can't watch the show if there's the same level of tension (sewing pun unintended). I was breathless reading it! And hey, who is ever going to see the back and the front at the same time (and I love the back!). And which op shop??? Ha! Love the pun and yes, good point about the front and back. I can't even remember which op shop it was now, but happy to share my favourite haunts over a chat on the school oval one arvo! Oh thank you! Yes, the back was certainly the best bit and the time constraints are such a killer. I had no idea! Thanks for taking part and good luck in the draw! This was so much fun Marianna. Such a good idea for a different challenge - loved it! So funny! Thanks so much for sharing how to get that widget and be able to watch the show! I have been keen to watch it but couldn't access it until now - just watched the first three episodes tonight and looking forward to the remainder over the weekend! Much appreciated. Oh, you're a champ. I'd have chain smoked the entire time. Or simply gone up in flames. Tim Gunn and Patrick terrify me.